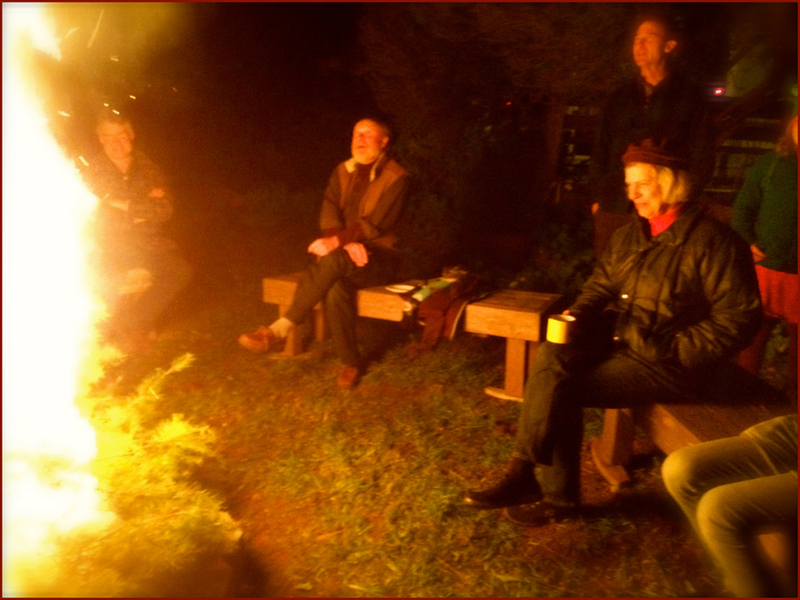 Friends gather around the fire and watch in awe as sparks fly. Definitions 1 and 3 (and possibly 2) were certainly in play last night as we gathered around the fire pit in our yard – hot coals from the fire we started late in the afternoon were ready to received the first greenery. We started off slow with some wreaths and cedar swag then moved on to our pile of Christmas trees. As the sparks began to fly on our little ritual, a daily ritual began in the sky; a golden orange melon-shaped waning gibbous moon began to rise over the hills directly to the east of us. This nightly celestial miracle, that often goes unnoticed, rose last night inline with our humble fire pit and as we threw another dry tree on the fire we watched amazed as the sparks reached up as if to join the moon’s glow. Last night’s tradition and friendship put me in the way of beauty – Thank You! This morning as I performed my morning ritual and rolled out my yoga mat, the sun began it daily celestial miracle and rose with glowing edges of deep orange emerging through a peachy golden mist. This morning bleary eyed and grumbling at the chill I was put in the way of beauty once again – Thank You! See if you can put yourself in the way of beauty – today and every day. “Put yourself in the way of beauty”- Cherly Strayed from her book Wild.